FROM TIME TO TIME I UPDATE THE PAYLOADS TO NEW AND BETTER ONES. 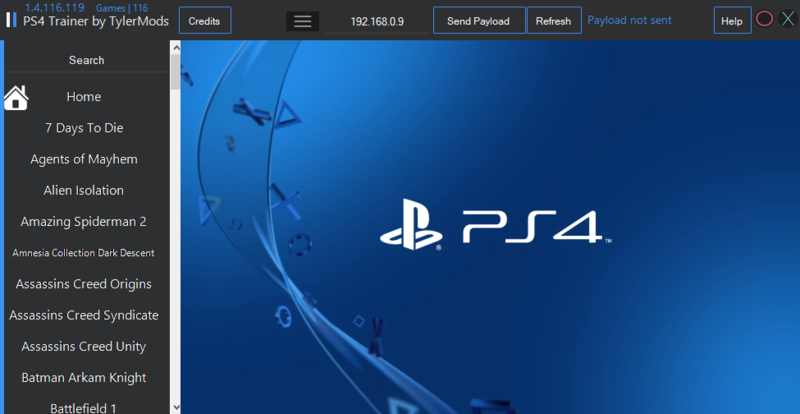 DO A FULL DOWNLOAD OF THE LATEST VERSION TO GET THE NEW PAYLOAD(S). THIS WILL FIX THE ACTIVELY REFUSED ERROR. YOU NO LONGER NEED MIRA OR HEN! JUST GO STRAIGHT TO ORIGINAL AND SEND THE PAYLOAD. IT CONTAINS HEN. It is possible these cheats work for different CUSA's. Just have to try and see. If you make a working .cht file. (Pointers preferred) I will add them. I just need you to provide CUSA and game version. Congrats dude, although the screenshot is too tiny, i'll give it a go. 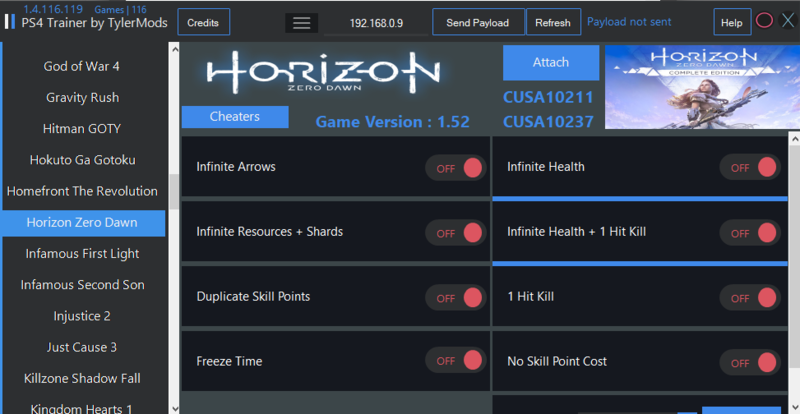 quesiton can we add put own cheats? Oh i see. btw i got some new cheat files for PS4-cheaters for you to test, now i can confrim that FFXV cheats doesn't work when you restart or reload the game. the address changes every time . same goes for Bloodbrone *work on reload and restart but once the items changes its slot in your inventory you have to find the new address" Dying Light Changes after each load like after loading a new area or after a cut scene. (it's sad because i got some useful cheats for items and money there ) i still need someone to test the cheats i found for The Order 1886 and Zombie (i don't have the game installed anymore ) the Order worked fine but it's tricky because you can't spot the changes right away example, you got 20 bullet, shoot one, now you got 19, activate code and reload, on next reload it'll show that you got 18, reload again and now it's 19 fervor (the value sat to 20 not 19) but it uses like one bullet each time you reload, but still work as infinite ammo code for pistol and rifle, my only issue is i deleted the game before i get to test the codes again after restarting the game. so i'm not sure about the addresses upon reloading the game. if you want i can give you the files to test yourself. Oh i see. btw i got some new cheat files for PS4-cheaters for you to test, now i can confrim that FFXV cheats doesn't work when you restart or reload the game. the address changes every time . 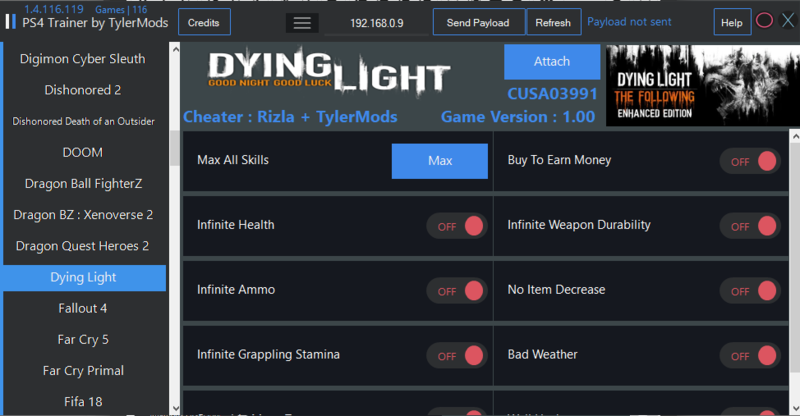 same goes for Bloodbrone *work on reload and restart but once the items changes its slot in your inventory you have to find the new address" Dying Light Changes after each load like after loading a new area or after a cut scene. (it's sad because i got some useful cheats for items and money there ) i still need someone to test the cheats i found for The Order 1886 and Zombie (i don't have the game installed anymore ) the Order worked fine but it's tricky because you can't spot the changes right away example, you got 20 bullet, shoot one, now you got 19, activate code and reload, on next reload it'll show that you got 18, reload again and now it's 19 fervor (the value sat to 20 not 19) but it uses like one bullet each time you reload, but still work as infinite ammo code for pistol and rifle, my only issue is i deleted the game before i get to test the codes again after restarting the game. so i'm not sure about the addressed upon reloading the game. if you want i can give you the files to test yourself. No cheat code will be usable after restarting the game due to ASLR protection. Nioh' codes works after reload though. You know guys all we need now is a save resigner!! we can add the cheats save and share them. No it won't, you can try with PS4 Cheater and see yourself. That's because PS4 Cheater uses jkpatch and jkpatch automatically disables ASLR, but that's doesn't mean the game executable address are static, just like iphone modding executable range start always changes with each load. My tool willl never struggle with an executable address.